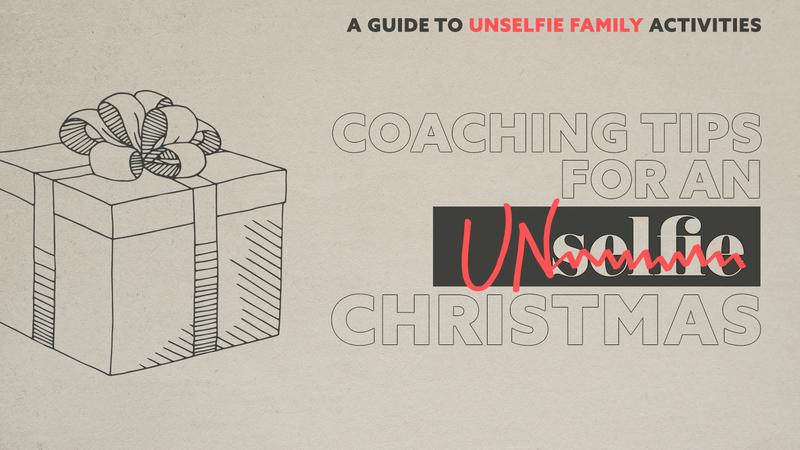 This Christmas season, we are collecting your coaching tips for how to have an ‘unselfie’ Christmas. Below is a running list of your submissions so far. We pray this list is inspirational, and helps you to develop some of your own ‘unselfie’ Christmas traditions! Check back throughout December to see if there are any added tips, and watch for future communications and tools to help keep the ‘unselfie’ trend going both at Christmas and all throughout the year! 1. We were friends with a couple at our church who were very selfless. In the six years we knew them, they didn't have more than a three-month span where they didn't have one, if not several, foster children. They both worked full-time, but still made time for serving at church, and they were always making meals for other people and inviting others over, hosting, etc., in addition to babysitting children they had previously fostered. Last fall, they had a two-year-old and his six and seven-year-old half-siblings, and a 15-year-old living with them whom they had already fostered, but who they had invited to live with them during her high school years to give her more support and opportunities to succeed (something they had seen the need for with her academic variance in middle school when she was going back and forth between her parents’ house and theirs). We wanted to give something to this couple who spent so much of their time, energy, and resources giving to others. We gave them a gift card to a restaurant in town where we had heard them talk about spending anniversaries and special occasions, and babysat their kids on the night they went out. 2. The week before Christmas, I overheard a co-worker who was a single mom complaining to another co-worker because the yearly Christmas bonus would be delayed by a week. She was a long-time employee, and since they were always given a standard Christmas bonus, she had come to rely on the bonus for her son's Christmas gifts. Without the bonus before Christmas, she was not going to be able to afford gifts for her son. I got her address from the office administrator and mailed her an anonymous Christmas card with money in it. The doctor with whom I worked overheard what I was doing (I was trying to figure out where to get her address) and pitched in as well! "For nine Christmases, our married children and grandchildren have joined us at a large rental home for several days or a week. Most of the time we have been out of state to be centrally located to all families. Each year someone finds a place for us to serve as a family - something that can include the youngest and the oldest of us. We have stocked shelves at food pantries, visited at nursing homes, interacted with children at a children's home. Each experience has been beneficial to us as well as to those we visited and worked with. We visited several of these places more than once and it was usually difficult to leave. One of my favorite memories is our grandchildren putting on a Christmas play for the children at the home. Afterwards we gave them cookies and icing and had a cookie decorating party. Our children had all brought donations for the home. It was a wonderful day." "Each year, I reach out to the school district from which I retired to obtain the names of children and families who are in need at Christmas. The school nurse provides names and the items the families need to us. We purchase those items and deliver them to the school. They are distributed to the families right before the holidays. We record this action every year and have been doing so for several years. That growing list hangs in a special place on our Christmas tree to remind us of our many blessings and the true spirit of the holiday." "As young adults now, we still do a names of Jesus study everyday for Advent and have special Advent devotions and candles and prayer every Sunday evening. We also try throughout the month to go to various churches Christmas concerts and plays as a family to make memories as well as focus on the birth of Christ." "We [my wife, a neighbor, and myself] open a table to hand out clothing for the homeless on the North Side each Monday evening." "Instead of buying extra toys for the grandchildren which they don't need, each family unit gets money to spend to go on a special family outing together that they would not normally have money to do, we have four family units. So each family unit has to take a selfie of themselves enjoying the outing and send it to the rest of us so we can partake of their enjoyment. I think this is a way to serve each other by teaching that time (not things) with each other and sharing memories are the real gifts." "We love to help our kids focus on others by placing more emphasis on giving gifts to others than the gifts that they will receive. We talk about how Jesus gave us the ultimate gift of salvation and how we celebrate by GIVING because he first gave to us." "We host a live, free nativity every year at our shop in Donaldson’s Crossroads to share the real reason for the season with children and families in our community. The animals are blocked off until all the kids have a chance to gather in a circle on the floor to watch a video about the first nativity. It blesses our hearts to fund this event to give children, who may not regularly attend church, the opportunity to celebrate Jesus’ birthday with songs and activities! We hope it’s something that resonates in their hearts for many years to come. You never know where and how God will choose to plant seeds. Merry Christmas!" "We start at Thanksgiving by volunteering with the local Salvation Army with prep and serving of dinner for the community and help them to prepare for their Christmas toy drive and prep for the food bank. We also help with the Christmas Eve dinner that they sponsor as well . We bake cookies for the neighbors and the kids at the local bus stop." "Our family serves meals to ARC Family Services in Washington. We also pack shoeboxes for Operation Christmas Child, and purchase gifts for the City Mission Angel Tree." We try to find out about a family in need. We buy presents for that family, and make cards. We anonymously drop off the presents on Christmas Eve night. It's a lot of fun. I like to be a blood donor during the holidays. They are always in need and it feels good to help in that capacity. Our family enjoys visiting a local nursing home and bringing cookies. We have done Christmas caroling, too! Our 4-H club went every year and the kids brought their pets. I like to help people in my neighborhood who are less fortunate and make cookies to give to less fortunate families. Also, when I’m in a store, I will start up a conversation with another person in line about how Jesus is the most beautiful and best gift we receive. Our family opens our gifts throughout the three days leading up to Christmas, and spends time together playing games and watching movies. Then on Christmas Eve we get our ‘big presents’ and go to church together. On Christmas Day, we read Scripture and sing Christmas carols around the piano, and try to make the whole day just about Jesus. Doing things this way helps Christmas Day to not be so overwhelming, and allows us to focus on Jesus and remember that it’s not all about the gifts. We host a birthday party for Jesus on the evening of Christmas Day. We bake and decorate a homemade cake and invite neighbors and other friends (some of whom are unchurched) to celebrate with us. In our family we give three presents just like baby Jesus received. It makes the gifts we give our daughters more thoughtful and meaningful. We start the morning by having a birthday party for Jesus (with a cake from Bethel Bakery of course). We look forward to singing Happy Birthday to Jesus each Christmas morning. Call/visit someone who is alone. Visit a nursing home and bring a gift for someone who is forgotten. Our family calling for Christmas is the international students of Pittsburgh. PRISM ministry is, in our estimation, the easiest way to reach the nations right here in our city. Not only in the Christmas season, but at any time you can reach out and invite a student to your home or spend time with them at Bellefield church in Oakland. With four daughters, it is our desire that the Lord’s passion in us would become their passion also, so they are a part of this outreach with us. One of our sweetest memories is having students in our home on Christmas Day, and sharing time with them. In a self-saturated culture, you must choose life-giving outreach in order to help transform the default patterns of selfishness in today’s families. This is the perfect time of year to remember that our Lord came to dwell with us. To Him be all the glory.